Famous character and local guide, Mohammed Bouskri, takes us on a tour today with stops at some exquisite palaces, Jemaa el-Fna Square, and the garden of Jacques Majorelle. Dinner tonight is at Mohammed's private riad. Hike along the Plateau du Kik, with incredible views of the High Atlas Mountains. After a picnic lunch in this unforgettable setting, spend the afternoon taking advantage of the Kasbah Tamadot's amazing pool and spa. 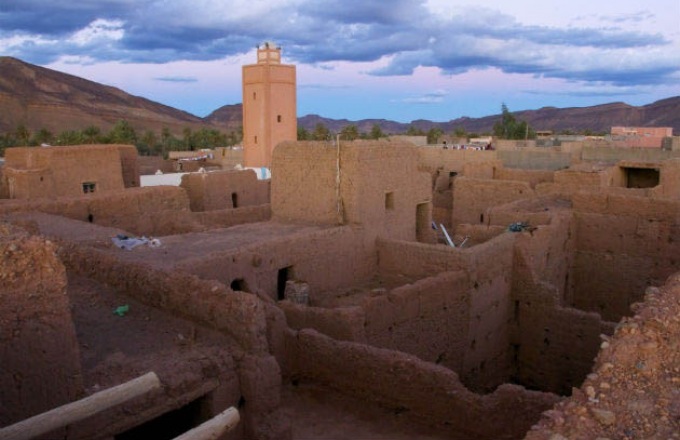 Hike to the remote Berber villages situated at the base of Jbel Toubkal (the highest peak in North Africa) and pay a visit to our local guide's home for some tea. Back at the kasbah, relax with an argan oil massage or pamper yourself with a hammam (steam bath) in the beautiful spa. Follow the same route travelled centuries ago by Africans carrying gold, silver and salt for trading. After a quick hike and a stunning picnic overlooking Aït Benhaddou, we'll settle in at the luxurious Dar Ahlam kasbah. Tonight, a delicious dinner awaits in an extra-special location! Walk the arid landscapes in Sidi Flah towards the Dades River, where refreshments await. This afternoon, explore the oasis of Skoura on foot, observing the quirks of day-to-day life in an oasis and the many kasbah remains. Pass by fruit orchards and countless rows of damask rose bushes as we explore the fragrant Valley of Roses. Tonight, a memorable evening awaits! You’ll be driven to the Ouarzazate Airport today in time to check in for your departure flight. Renovated by the French interior designer Jacques Garcia, La Mamounia offers everything you'd expect from the lap of luxury. The pool and spa are out of this world and the location is unsurpassed. The leafy 18th-century park surrounding the property was created for a local prince, Mamoun, whose name inspired the title of the hotel. Daily walking distances usually vary from 5 to 13 km (3 to 8 mi.). Walks are generally easygoing, with a few options for a challenge along the way.